From Tim Bekaert collection. A very remarkable feature called Avenue of Giant Redwoods in Argyll area Benmore Gardens. Of the 50 planted trees, the weakest one did not survive the heavy weather of 1968, so this avenue now consists of 49 145 year old giant redwoods that are about 50 m.
Kenilworth Castle Tree , City of Gloucestershire. I happen to be the 3rd Great Grandson of a Scottish Forester by the name of Patrick Matthew who along with his son John D. Matthew were the ones who won the race to introduce the Redwoods to Europe. 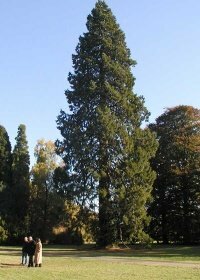 The first original plantings of the Giant Sequoia's outside of their original indigenous native California habitat were planted at Inchtures in the Carse of Gowrie, Perth Shire, Scotland. The original seed stock came from a packet of seeds collected from what is today known as the North Grove of Calaveras Big Tree State Park and were sent to Patrick Matthew in 1853 by his son John D. Matthew, a Mining Engineer and Botanist prospecting for gold with two of his brothers near the Chilean Mining Camp. The origin of those seeds was described in a letter written in early July 1853 arriving with the seed packet which Patrick Matthew then sent excerpts of to John Lyndel the editor of the Gardeners Chronicle. John D. Matthew... as later proven in 1866... was also the originator of naming the trees after the Duke of Wellington. John Matthew is the originator of the Wellingtonia gigantea name that even to this day some in Europe still incorrectly use to refer to these trees.. ( See patrickmatthew.com...then click on "The Matthew Redwoods" in the Blue subject field and read below. ) John Lyndel sat on that letter for a year and did not publish it until 1854. During that interim he falsely portrayed himself as the one who proposed the Wellington name and William Lobb of Veitch Nursery as the individual who introduced the Trees to Europe. The matter was finally settled 13 years later in 1866 a year after John Lyndel died when the then editorial staff wrote a retraction and credited John D. Matthew with having collected the first seed and the Wellingtonia naming and Patrick Matthew as the first to introduce and plant the first Sequoias in Europe. Howard L. Minnick Major, ENGR United States Army(Ret.) Botanist, Range Conservationist & 3rd Great Grandson of Patrick Matthew.